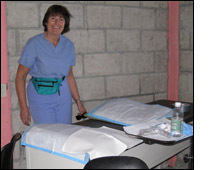 As part of our January 2008 Fairfax-VCU Brigade trip to Pinares, Honduras, we screened women for cervical cancer. The process involves using vinegar to stain the cervix and visually inspecting it for aceto-white lesions, which are associated with cervical dysplasia. We screened 76 women who had walked anywhere from 20 minutes to 3 hrs to the clinic. Most reported that they had never been screened. Some stated that they had had a pap smear sometime in the past one time, but had not received the result. As part of the project we interviewed each woman concerning her obstetric and gynecological history including contraception. Most of the women were multiparous, having delivered most of their children at home. Many reported having delivered her last child in the hospital in La Esperanza (about 1 � hr bus trip from Pinares), where they had undergone a tubal ligation. It seemed that they were making the decision to deliver this baby at the hospital in order to have the tubal ligaton. A few women were receiving Depo-Provera injections every 3 months for contraception from a public clinic. Some were satisfied with this choice; others had concerns about weight gain and irregular menses (which are expected). None were using oral contraception, or IUD's. These did not seem to be options. Most women tolerated the procedure without problems; though some were embarrassed and shy even though they had come for the exam. Women were all given a illustrated handout describing the procedure and the result. We wrote the date exam was done and the recommendation that they be rescreened in 3 yrs. I plan to work with the Pinares project planning committee to continue this project with the goal of screening all women ages 30 and older in the Pinares clinic area over the next 3 yrs.